Update! I've added figures for Helsinki (thanks Tommi) and Vienna (from here). Details are in the accompanying spreadsheet. It would be very interesting and useful to have some statistics allowing us to compare the safety of cycling between different cities around the world, but this kind of thing is very hard to come by. As far as I can see it's nobody's job to collect statistics from cities in different countries, so at present nobody does it. In some places, individual city governments/authorities/mayoralties do collect and publish statistics, but only some of these are comparable with other cities. This post is the start of an attempt to collect together figures which we can use to compare London to other cities in terms of cycling casualty rates. Please note, these figures are just initial estimates, cobbled together from available sources, some of which may not be correct. I would very much welcome any better information, and especially any similar information for other cities. If there's something here you think is wrong, instead of getting annoyed why not send me a correction? 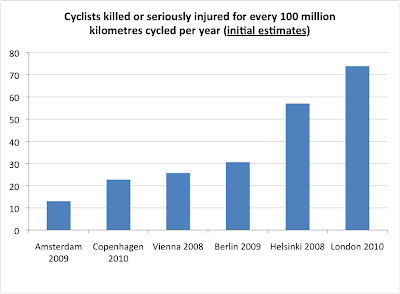 The table and chart below show some summary information on distance cycled, cycle casualties, and the cycling casualty rate (per distance cycled) in Amsterdam, Copenhagen, Berlin and London (and now Helsinki and Vienna). This spreadsheet gives more detail on the sources, which where possible are official statistics but in a couple of cases (e.g. the total distance cycled in Amsterdam per day) are not. 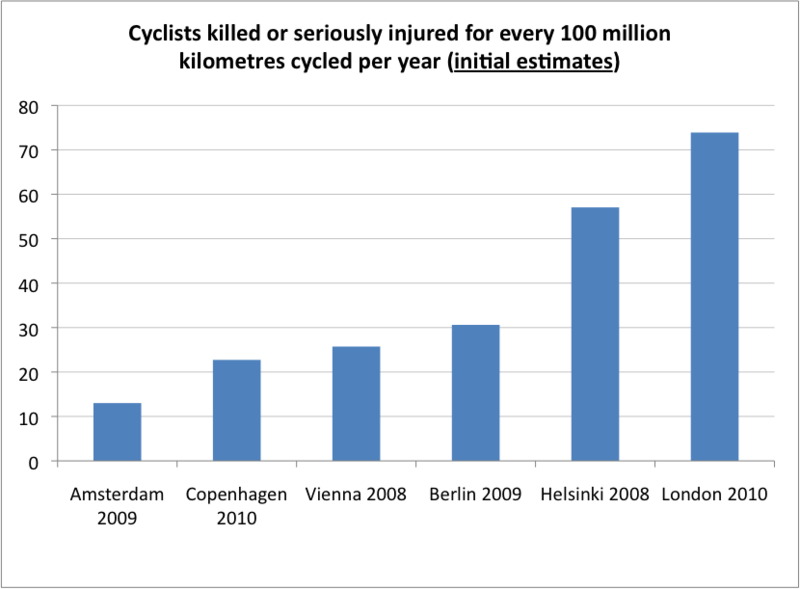 For the casualty rate I've used the number of cyclists killed or seriously injured per 100 million kilometers cycled per day in each city. I know the casualty rate per km isn't very good for comparing the relative risks of different modes of transport where the average trip length is very different, but it should be fine for comparing cycling casualty rates between cities. I guess you could also calculate a casualty rate per trip, but then you get into how to define a 'trip', which isn't as straightforward as you might think. I should probably say that this certainly isn't an attempt to make London look like a dangerous place to cycle. While I think it could certainly improve on that score, I'm sure there are many, many cities with worse casualty rates. But most of them probably don't collect any robust, comparable statistics. There is a selection bias of sorts at work here, in that it is generally those places which have fairly strong cycling cultures which collect the best statistics on cycling. I'd love to add some more cities, but comparable data is hard to come by. I looked around for data from Paris and found absolutely nothing, while I couldn't find any statistics on distance cycled in New York. Any help on these two or on any other cities would be really appreciated. Another important caveat: In each case I've taken the city borders as read. Measuring the extent of a city is notoriously difficult, everyone does it a bit differently, and in most cases statistics are just based on administrative borders rather than any 'functional area'. So it maybe that with these statistics each city is defined differently, for example with some including suburbs and some not. I know that the London area used here includes a lot of suburbs, but I don't know whether the other cities do. I'd be interested to hear from anyone who does and who thinks this might significantly affect the answers. 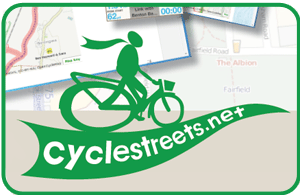 Jim, I recommend checking out the knowledge base of the Dutch Bicycle Council, aka Fietsberaad.nl. It has an English version too. also check John Pucher's publications and research lists for comparative data, incl between US & Europe. Thanks very much for the links, Marc. That's brilliant, thanks Tommi. I'll add those figures in when I get a chance. Good stuff, very close to my heart as modal risk has long been an interest of mine. One point is that I would be very wary of using KSI, better to use fatality data only, as it will be pretty accurate. The trouble with the SI data is that a) their collection is not complete, and b) the definition may vary from country to country. You need to be especially careful comparing pedestrian and cyclist casualty rates, be it fatalities or SI's. All the official studies get it wrong because they fail to understand that pedestrian falls are not recorded anywhere as transport casualties, so they get missed out.